Some people claim veggies like kale are overrated. While these trendy foods do offer many health benefits, they are not the only things your senior loved one should eat. Here is a list of underrated veggies that offer several health benefits. Make sure your loved one eats as many of them as possible. They look like green onions, and you can use them in any dish as an onion or garlic substitute. Leeks are packed with essential nutrients like vitamin A, which is essential for bone and immune system health, and vitamin K, which your loved one needs for healthy blood. They also contain cancer-fighting antioxidants. If you need help encouraging your senior loved one to eat healthy food, consider hiring an in-home caregiver. Not every senior has the same care needs, which means they don’t all need the same home care services. Rhode Island families can rely on Home Care Assistance to provide individualized care plans to meet your elderly loved one’s unique care needs. Our holistic Balanced Care Method was designed to help seniors focus on healthy lifestyle habits such as eating nutritious foods, exercising regularly, and maintaining strong social ties, and our Cognitive Therapeutics Method offers mentally stimulating activities that can stave off cognitive decline and delay the onset of dementia. Brussels sprouts have a bad reputation because of their bitter taste, but you can turn them into a healthy side dish for your loved one. Avoid overcooking Brussels sprouts, and try steaming them until they start to soften. 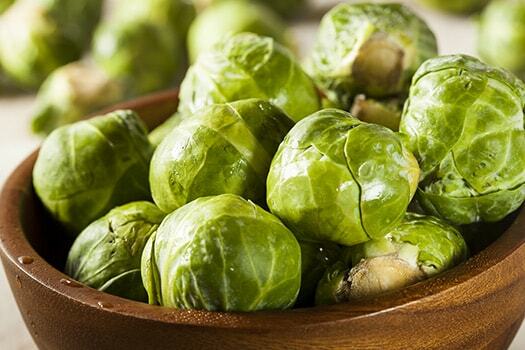 Brussels sprouts are high in fiber, which most older adults do not get enough of. They are also high in vitamin C, which can strengthen the immune system. Celery is an excellent choice for seniors with high blood pressure. It contains a compound called phthalide, which can act as a diuretic. It’s good for the circulatory system, and because it’s low in calories, celery can be a great choice for seniors who want to lose or maintain a healthy weight. While cauliflower is becoming a popular low-calorie and low-carb alternative to foods like potatoes and rice, it offers more health benefits than most people even realize. Studies have shown cauliflower is rich in compounds called glucosinolates, which fight cancer cells in the body. Since seniors are at a greater risk for cancer than other age groups, every little bit helps prevent it. If your loved one is looking to lose weight, cucumbers make a great snack. One cup of this veggie has only 4 carbs and 16 calories. Stick a cucumber in the fridge or freezer for a little while during the summer for a delicious snack. Cucumbers offer many nutrients, including vitamin K for healthy blood, potassium that can lower blood pressure, and manganese, which is essential for strong bones in the golden years. When it comes to healthy meal preparation for aging adults, respite caregivers can play an important role. Family caregivers sometimes need a break from their caregiving responsibilities. When they need respite care, Rhode Island families can rely on professional caregivers to help their senior loved ones remain safe at home. If your loved one has anemia, a daily dose of green beans might help combat the condition. These veggies contain folate, which is known for increasing red blood cell production. Seniors who don’t get enough folate are at risk for becoming anemic. Green beans are also rich in vitamin C and low in calories. Beets aren’t the easiest veggies to cook or incorporate into a meal, but they are worth the effort. Studies have shown they contain antioxidants that may fight or prevent cancer. Beets are high in folate, which can prevent anemia, and rich in potassium, which can lower high blood pressure. Eggplant can be a great meat substitute for seniors who are vegan or vegetarian. This veggie is high in fiber, which can prevent constipation and other digestive issues common among seniors. It’s also high in calcium, which promotes strong bones and teeth, and it contains plenty of potassium for combating high blood pressure. If your elderly loved one is living with a serious medical condition and needs help managing the tasks of daily living, reach out to Home Care Assistance, a Rhode Island home care agency you can trust. Our caregivers are available 24/7, there are no hidden fees in our contracts, and we offer a 100% satisfaction guarantee on all of our in-home care services. For more information, call one of our friendly Care Managers at (401) 284-0979 today.